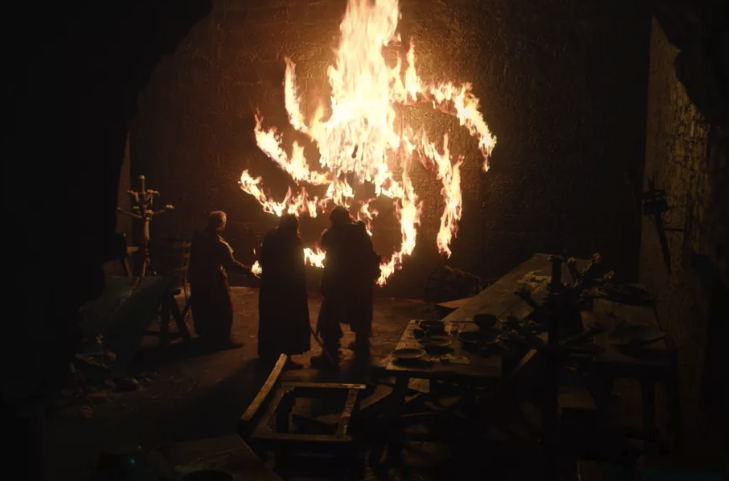 The Game of Thrones Season 8 premiere featured a pretty grisly scene: Tormund, Beric, and Edd meet up at Last Hearth (the holdfast of House Umber) and discover its inhabitants have already been slaughtered by the White Walkers, who have left a message — written in body parts. The body parts form a spiral pattern, with the corpse of little Ned Umber (who then turns into a wight) pinned at the center. Beric lights the whole thing on fire to kill Undead Ned, and it really, er, elevates the artwork. This isn't the first time we've seen the White Walkers create "art" with body parts. In fact, it first happened way back in Season 1, Episode 1 — although the pattern was different. In this scene in the pilot episode, three Night's Watch men find the pattern and are then attacked by a wight child. The Last Hearth sequence in the Season 8 premiere was obviously a direct callback to this. But there's more to it. We later see the spiral pattern itself in Season 3, when Mance Rayder and Jon Snow find the horse corpses the White Walkers left from their battle with the Night's Watch. Mance says, "Always the artists," implying he has seen this type of pattern created by the White Walkers before — or that he knows of it, at least. The spiral pattern is significant because, as we see in Bran's vision of the birth of the first White Walker in Season 6, it was presumably used for magical purposes by the creators of the White Walkers, the Children of the Forest. The same spiral stones, grouped around the now-frozen weirwood, are seen in another of Bran's Season 6 visions – when he finds the Night King and his army, and the Night King leaves his mark on him. This is obviously an important place for the White Walkers. It is the spot of their creation, after all. Perhaps the spiral pattern is simply a reference to this — a mark they leave on the world. Or maybe it's connected to their magic, and they need to keep recreating it in order to do...whatever they plan to do. There's other patterns in the cave too — including this one, which almost looks like the circular and spiral patterns combined. 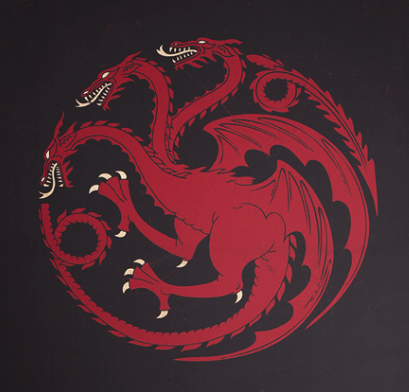 Also, maybe it's just me — but doesn't the spiral pattern look a lot like the Targaryen sigil?! Of course, the message from the White Walkers could be rather simple: we're coming for you. No matter what the precise meaning is, they undoubtedly seem to connect the White Walkers to Jon and/or Dany in some way. Here's hoping we get a solid answer before Season 8 is done.